Notes: Migration this week continued at a similar pace to week 10 – in other words, numbers were a bit above average for this fall, but somewhat lower than long-term means for the period. The 2638 birds banded so far this season is more than at this point in 2007 or 2011, but lower than all other years. It is perhaps too early to draw conclusions, but intriguing to note that a four-year pattern is starting to appear with respect to these fall lows. Again though, diversity remained above average, with the 74 species observed this week just one below the record set for week 11 last year, and 141 species for the season only two short of the record pace of 143 at this point both last year and in 2013. Temperatures were again above normal for much of this week, most notably with a record high of 25 Celsius on Thanksgiving day. It was a good week at MBO for uncommon to rare birds. The Bicknell’s Thrush banded this week was our first of 2015, and in fact the first observation of this species at MBO since the first week of October 2012. We recaptured it a couple of days later, marking the first ever repeat of this species at MBO. We also observed and banded our first Yellow Palm Warbler of the year this week, and observed Eastern Screech-Owl during the daytime operations of the Fall Migration Monitoring Program for just the fifth time in 11 years. The Evening Grosbeak observation this week was the first in nearly two years. But as noteworthy as all of those was the Blue Jay that we recaptured on Thanksgiving morning – and upon checking our database realized it had been banded more than 11 years earlier! 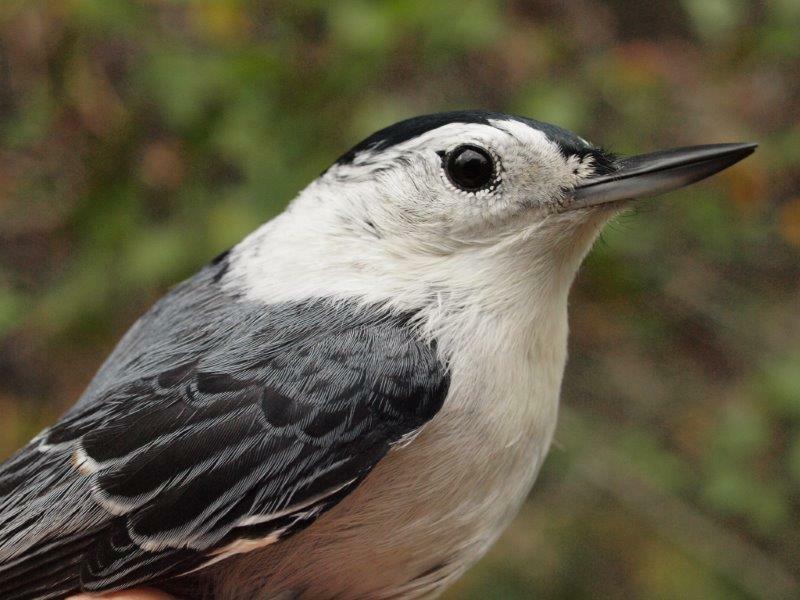 In fact, it was among the first 100 birds banded at MBO during our pilot season in September 2004; it was recaptured again that November, but not recorded since, so this was a remarkable rediscovery. White-throated Sparrow and Ruby-crowned Kinglet swapped positions this week at the top of the list of birds banded, but both were far more abundant than any other species. This is the second year in a row that White-throated Sparrow has topped the week 11 list; the previous three years it ranked second, and prior to that it was never higher than fifth! Ruby-crowned Kinglet has been more consistent over time, among the top three in week 11 every year except 2008 (fourth) and 2010 (seventh). Despite good counts over the past two weeks, both species are still below average for the season. Yellow-rumped Warbler migration is nearing its end, but there were enough this week to crack the top three even though the season total to date of 57 suggests this will be the poorest fall migration for the species at MBO. Continuing the theme, American Robin was in fourth place this week, bringing the season total to 47 banded, well below the long-term average of 85 by this point in the season. Junco numbers slipped slightly from last week, but we suspect more are yet to come. American Goldfinches have been erratic this fall; this marks the first time ever they have been in the top ten during week 11. 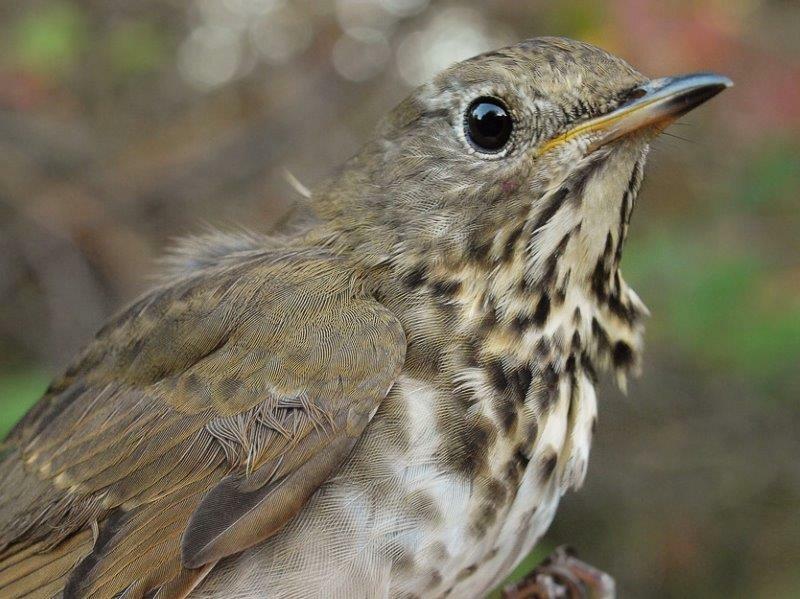 This is the traditional peak of Hermit Thrush migration, but the 11 banded this week was the third-lowest total ever for this week, and the season total to date is less than half the long-term mean. Golden-crowned Kinglets were again far scarcer than Ruby-crowned, heading toward the lowest fall banding total since 2009; tied with them in eighth place was Purple Finch, with a surprisingly strong showing for a second week in a row. Rounding out the top ten was an eclectic three-way tie, with two common late season species (Black-capped Chickadee and Song Sparrow), and one that has only been in the top ten for the week once previously (Orange-crowned Warbler, in 2006); this was only the third time ever that 5 or more Orange-crowned Warblers were banded in a single week at MBO. Among species observed, results were relatively similar to last week, with nine of the same species dominating, while Black-capped Chickadee replaced Yellow-rumped Warbler in tenth place. Canada Goose numbers declined by more than half compared to week 10, but were still high enough to take first place in week 11 for the third year in a row, and sixth out of 11. In four of the other years, the top bird has been American Robin, which was second this week, with numbers building in advance of the traditional late October peak. Mixed blackbird flocks remained common this week, with Red-winged Blackbird and Common Grackle both in the top four, sometimes joined by European Starlings. White-throated Sparrows were present in almost the same numbers as last week, but shifted up one place in the rankings; conversely Ruby-crowned Kinglet numbers tapered off slightly and they dropped one spot. Remarkably, Blue Jay numbers remained high for yet another week. On the owling front, it was another productive week, with another 55 Northern Saw-whet Owls banded. The biggest movement was on the night of October 14, with 24 individuals – the busiest night of the season so far, and the fourth highest single-night total in MBO’s history (behind 25 on October 5, 2011, and 30 on both October 22, 2011 and October 16, 2012). The season total to date is up to 107, second to only the record high season in 2012. There was one more foreign recapture this week, banded in early October 2014 at Innis Point Bird Observatory in Ottawa, roughly 200 km west along the Ottawa River. Notes: Befitting an unusually quiet fall migration, results for week 12 were close to record lows. The total of 159 birds banded this week was only slightly more than the record low of 139 for the period in 2011, and the season total of 2797 is not far ahead of the low of 2646 at the same point in 2011; unless numbers pick up in week 13, this will mark just the third time in 11 years that the season total falls short of 3000 individuals banded. On the other hand, diversity has been particularly high this fall, as this is just the second time the 80-species threshold has been reached for the season. Similarly, the 66 species observed this week was a new record high for week 12, although the count of 145 for the season is a bit behind the high of 148 at this point in the season in 2005. Weather was largely more seasonal this week, and one day was lost to rain, although effort on the whole was still above average for week 12. One of the inherent contradictions about late fall is that while migration is slowing down overall, we usually get an influx of “new” species for the season. That held true this week both for species observed and banded. The first Horned Lark of 2015 was seen this week, while Red-bellied Woodpecker, Bohemian Waxwing, and American Tree Sparrow were new for fall. It was the latest ever fall arrival date for American Tree Sparrow, while Bohemian Waxwing has not been observed in fall since 2012. For the third time in five years, a Northern Saw-whet Owl was banded as part of the morning banding activities, presumably a bird that came in during the night but was not captured during the owl banding efforts. 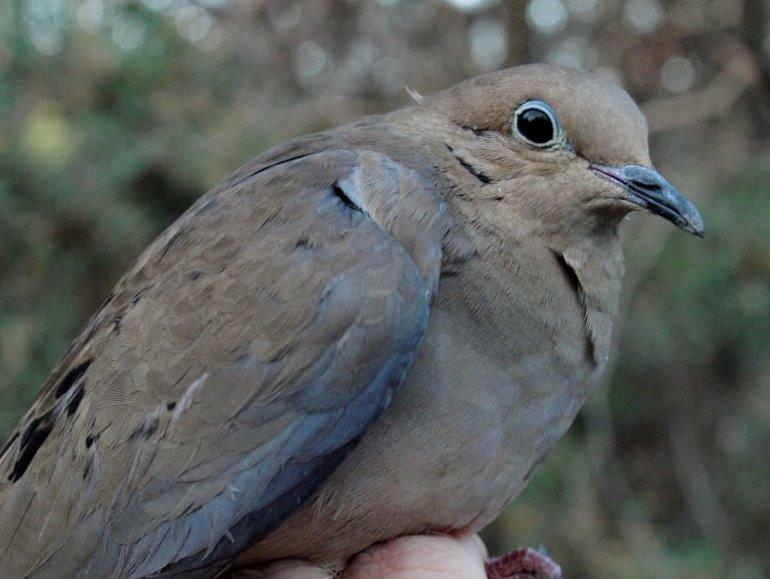 Mourning Dove was also banded for the first time in 2015, while American Tree Sparrow and Fox Sparrow were banded for the first time this fall. American Robin was the top species banded in week 12, for the sixth time in 11 years, even though the number banded was well below the mean of 80 for this period. Ruby-crowned Kinglets were also close to half as numerous as usual (ten-year mean of 33 banded in week 12), but White-throated Sparrows and Golden-crowned Kinglets were marginally above average. 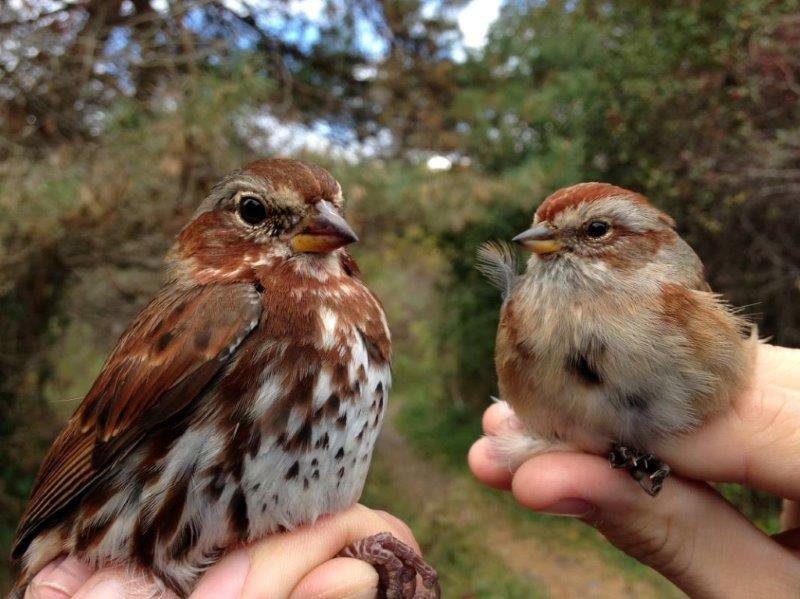 We banded 11 Hermit Thrushes for a second week in a row, but the season total remains lower than normal. In an unusual occurrence, the bottom half of the ten comprises nothing but sparrows. Reflecting the overall low numbers this week, all of them except Swamp Sparrow were banded in below average quantities, most notably Slate-colored Junco (ten-year mean of 55 individuals in week 12). What happened to the geese? That was one of the most notable changes among birds observed this week, with Canada Goose falling out of the top spot, and the mean daily count of 68 lower than ever before for week 12. Instead, American Robin took over as the dominant species, topping the list in week 12 for the fourth time in 11 years. Red-winged Blackbird was the runner-up, and has now been in the top three at this time of year for ten years in a row. Rounding out the top five were Common Grackle and European Starling, both common in late fall. White-throated Sparrow numbers declined compared to last week, but remained higher than in any previous week 12 except for 2014. Among the corvids there are opposing records – the mean daily count of American Crow was far below the previous low of 53 in 2013, while the mean daily count of Blue Jay was above the previous high of 18 in 2011. The mean daily count of Slate-colored Juncos has surprisingly high, considering how few were banded this week; Black-capped Chickadee completed the top ten with somewhat below normal numbers. In more positive news, it was a remarkable week for the owl banding program, with 107 Northern Saw-whet Owls banded – shattering the previous single-week record of 75 (October 3-9, 2011). This week’s tally perfectly doubled the season total; the 214 individuals banded to date is one ahead of the record pace in 2012. 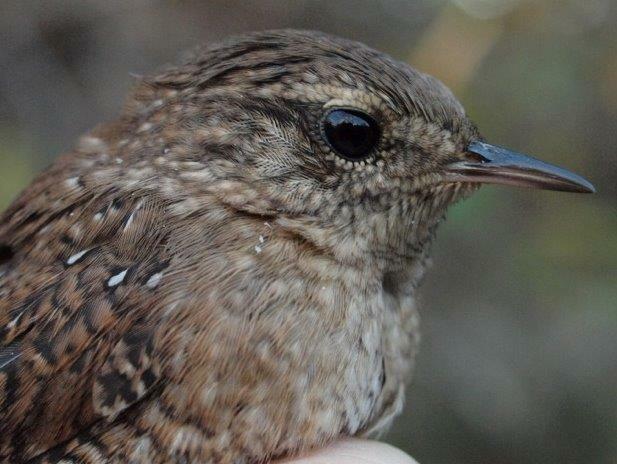 No doubt this marks the highest ratio ever of owls to songbirds banded in a single week! In addition, one foreign-banded owl was captured this week, but no details are available yet as to where it was banded.